During the early days of my guiding careerI found out real quick that post spawn muskies where very unpredictable, locating them seemed difficult and finding the eaters even tougher. Experience is king when your pursuing muskies and the many years of knowledge I have behind me has bettered my game. For the past fifteen years I have been fortunate enough to fish for muskies during post spawn nearly everyday while guiding in Kentucky, then just a few months later experiencing the same scenario on the northern waters of Wisconsin. Those years in Wisconsin has made me understand the post spawn period dramatically, those findings have extremely increased my production down south as well where the spawn is less predictable as most muskies only go through the motions. Let me share some of my experiences during that post spawn period where i’ve found muskies can scatter from shallow to deep water. The spawn is much more obvious in the northern range of the muskie world, fish here are much more, bruised, battered and stressed. One big factor in my learning curve about these pre spawn muskies is tournaments held during this early season. Rollie & Helens for many years held one just after the opener, the Headwaters Chapter of Muskies Inc. for more than 20 years have been hosting an event just a couple of weeks later, boy can I remember struggling while competing in those events in my early days of participating in those tournaments. Analyzing what I experienced and learning what worked has helped me today in understanding how to attack these lackadaisical recovering muskies. During those first few Rollie & Helen’s events I began to understand that the shallow water locations that seemed to be so popular down south where not near as effective on northern waters, a must deeper bite existed which was completely foreign to me. On the other hand I watched events that many of the fish come from the shallowest water, since those days i’ve learned the progression of water temperatures dictated those findings and where I should start in my pursuit. Surface lures like the Top Raider and Pacemaker, have been a big key for my clients for over a decade now during the early season and recently Tyrant Tackle’s Crusader and the One Eyed Willies from Monster Lures have produced . Baitfish movement however also becomes a big key into locating feeding muskies and temperatures are probably a contributing factor to their movement, the warmer northern openers tend to keep those recuperating muskies shallow, smaller baits with a little faster presentation seems to be what it takes to consistently boat fish. However when you add into the mix a cold-front these lackadaisical muskies seem to be bottom huggers in mostly deeper waters. Big Joe’s, Medusas and Bulldawgs has earned many tournament payouts in events just after the opener. Main Lake points, open water humps and the deepest weed edges are areas that need concentration. My clients and I have experienced great success with the “old school” lure the Mepps, in many different sizes and color combos. Couple reasons here, i’ve found fatigue during my clients first few outings of the year kicks in specially late in the day, we all know there’s not much easier to cast and retrieve than a small bucktail. 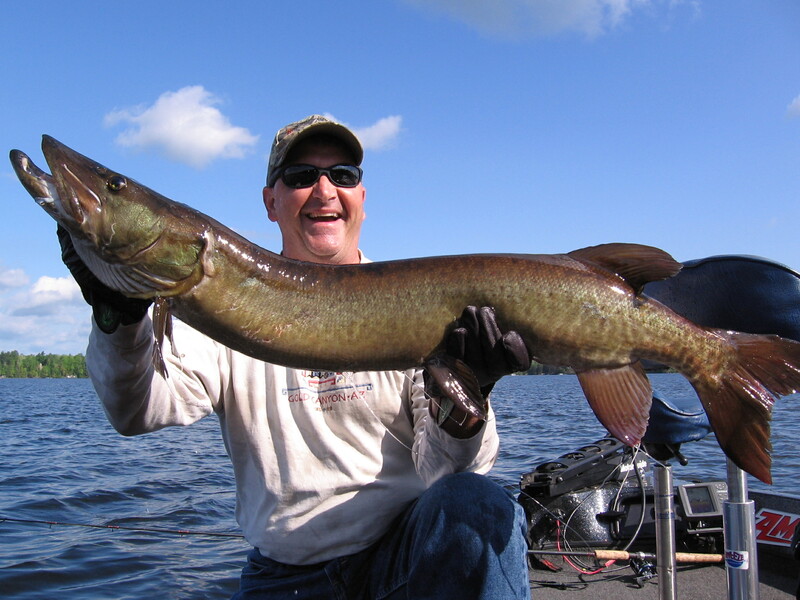 My northern post spawn experiences have mainly been limited to northern Wisconsin so I ask good friend and Co Host of Musky Road Rules Gregg Thomas, Gregg like me escapes the dangerously hot waters of the summer months in the south and heads to the waters of northern Minnesota. I ask Gregg to share with us just how he and his clients have been so successful just after opener. Here’s what Gregg had to say. When it comes to spring fishing especially post spawn I take a different approach then most. When I first get to Minnesota in the spring, which is usually in mid June, I spend a lot of time in the open water. I have noticed in most natural northern lakes in the spring before the summer heat sets in the fish especially some of the biggest fish will spend a lot of time recouping from spawn in the open water. Most all lakes have at least one deep basin. A section of the lake that consists of the deepest water and it is in these sections that there will be a majority of the bait suspending over nothing but open water. It is in these areas that the muskies as well as other fish will be suspending as well. These areas are often over looked by anglers in the spring but by taking a little time to explore the open water many anglers will be surprised by what they find. One common denominator between post spawn muskies both north and south is predictable lure size, while many larger lures generate a good number of muskies in deeper water, those muskies shallow tend to follow the big stuff but comment to the smaller lures. Southern reservoirs have become very famous over the past decade for their pre spawn muskie fishing, most noted is the number of fish caught rather than a time for trophies, however the much overlooked post spawn period down south consistently produces hungry post spawn giants. As I mentioned before the post spawn period on most southern waters is much tougher to identify compared to up north. The southern reservoirs of the south have a completely different make up than the waters up north other than the flow-age systems. Southern reservoirs consist mainly of feeder creeks and coves which is the targeted area for the shad spawn and then of course muskies go through the precess here too. Spawning coves and creek arms are easily identified on the reservoirs of the south however pinpointing the time of the spawn is much more difficult than the waters of northern Wisconsin that I fish our waters during many years warm much more rapidly than normal leaving us wondering “have they or not”. I’ve personally experienced years that muskies we’ve caught have dropped eggs in my boat from late March to Mid May in the same year. In Fact a former Kentucky State Record caught by local angler Scott Flatt on May 9th from water well over 70 degrees was dropping eggs and caught from deeper water that probably hadn’t warm yet under our normal spring murky water conditions. Many anglers have a different approach to our southern muskies just after the spawn, Mountain Muskie Lodge guide Scott Salchli one of the top anglers on Cave Run and PMTT champion agreed to share his favorite post spawn technique with Musky Hunter readers. Scott said new weed growth is his key ingredient, weeds located near main lake points and deep channel edges are his prime targeted areas for him. Scott puts many trophy fish in his boat each year casting surface lures overtop the new weed growth, his favorites here are the side to side action of a One Eyed Willie or the stubble retrieve of a 1/2 bass style buzz-bait by Lunker Lures. Scott and his clients have taken dozens of trophy fish using this method. One of my favorite personal post spawn tactics for my clients on my home waters in Kentucky puts me and my clients in the same type areas as Scott, targeting the new weed growth. However here I like working buoyant jerkbaits that move more up and down just over the weeds even dipping down slightly touching the tops, my go to baits here are Suick’s, Burts and the Sledge. I don’t limit these areas to that one presentation, I also like side to side glides like the Hang Ten Manta moved rapidly over the weeds, on years the weed growth is very quick and top out high the shallow running Manta can be very effective. Historically southern muskie fisherman have been mainly shallow water anglers, just over the past few years have we discovered the value of deep structure for post spawn muskies. Influenced by experience of the success we’ve seen from tournament anglers of the north, just applying it to different structure types. Seeking out main lake and timbered points, as well as the deeper weed edges should be one of your main target areas. Rubber and deep diving cranks will pay big dividends. Try working Bulldawgs, Bondy’s, Medusas and Red October Tubes allowing them to get down or casting Lil’ Ernies, Baby Depth Raiders, Deep Invaders, Hellbenders and Bill Norman Baltic minnows with a stop and go retrieve. Short-line trolling slowly warming waters has become a great tactic soon after our muskies go through the spawning motion. Concentrating on the new weeds outside spawning areas and main lake points, position your boat at the first significant drop, as sight as this drop maybe generally found in that 8’ to 10’ depths just off the weeds. Setting your lines from 8’ to 15’ behind your rod tip using a variety of shad size lures, smaller bass baits score too at this time of year. Keeping your lures as tight to the cover as possible is key, look for those pockets and quick turns in the weed edges. 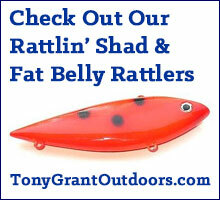 Try shad sized baits with a good wiggle, Slammar’s Rattl’N, Tuff Shad, Lil”Ernies, and Marshads are among my favorites. Finally, as similar as the post spawn can be from south to north they can also be quit different, in both situations there is not just one technique that stands out. Your better off trying something and being disappointed rather than be disappointed you didn’t try. So next time you find your muskies in a post spawn mode whether it be on a reservoir down south or the famed waters of Wisconsin or Minnesota try some of the mentioned methods and you just might land one of your biggest fish of the year.